There are 2 types of car seats that are for rear-facing, infant carriers and convertible seats. Infant carriers typically have weight limits of 22, 30, and now 35 pounds. Convertible seats have rear facing weight limits of 30, 33, 35, and now 40 and 45 pounds. Children should start rear-facing the day they come home from the hospital. The minimum by law in all states to stop rear-facing is 1 year AND 20 pounds. The child must meet both of these requirements, not one. However, a lot of child car seats available today have forward-facing minimums of 1 year and 22 pounds. At least one manufacturer, Dorel (they include the brands Cosco, Safety 1st, and Eddie Bauer) also has a minimum height requirement. This is why it is important to read and be familiar with the instruction manual for your child’s car seat. However, best practice suggests otherwise. Safe Kids USA, NHTSA, and the American Academy of Pediatrics now recommend that all infants and toddlers should ride in a rear-facing child car seat until they are at least 2 years of age or until they reach the highest weight or height allowed by the manufacturer of their child car seat. At age 2, if a child is still within the weight and height limits of their child car seat, they should remain rear facing until they reach those limits. A common misconception is that a child is ready to travel facing forward when his neck muscles are strong enough to support and control his head. However, crash dynamics show otherwise. Because the torso is restrained, the head is free to move around. The rigidity of the bones in the neck and strength of the connecting ligaments (not the muscles) hold the adult spine together and keep the spinal cord intact within the confines of the vertebral column. Very young children, however, have immature vertebrae that are still partly made of cartilage. These are soft and will deform and/or separate under tension, leaving just the spinal cord as the last link between the head and the torso. According to documented research, autopsy specimens of infant spines and ligaments allow for spinal column elongation of up to two inches, but the spinal cord ruptures if stretched more than 1/4 inch. Real-world experience has shown that a young child’s skull can be literally ripped from her spine by the force of a crash. (Refer to here for more info) There are also some benefits to being rear-facing in a side impact crash. Another common misconception is that a child should switch to forward-facing when their feet touch the vehicle seatback or the legs must be bent. There are no documented cases where a child’s legs have been injured because they were rear-facing. And even if there were cases, a broken leg is much easier to fix than a broken neck. You may think no one rear-faces that long, but from personal experience, my oldest was rear-facing until the age of 2 and my second child rear-faced until age 2 1/2. You can see more pictures of kids rear-facing past the age of 1 in this album. Here are some important things to remember when using a rear-facing car seat. Never place a rear-facing car safety seat in the front seat of a vehicle that has an active front passenger air bag. If the air bag inflates, it will hit the back of the car safety seat, right where your baby’s head is, and could cause serious injury or death. Make sure the harness is positioned at or below your child’s shoulders. Since children grow in different proportions, it is important to know the height limit of the car seat, but it is also important to make sure that there is always at least 1″ of car seat shell above the child’s head. This article shows how to check for the 1″. If you are using a convertible seat for rear-facing, make sure the vehicle belt or LATCH strap is routed through the correct belt path of the seat. If installing with a seat belt, make sure that the LATCH strap and top tether are secured to the car seat so they are not loose to cause injury. If you are installing with the lower anchors, you may consider buckling the seat belt and locking it before installing the seat so your child will not play with the loose seat belt. Make sure the seat is at the correct angle so your infant’s head does not flop forward. Many seats have angle indicators or adjusters that can help prevent this. If your seat does not have an angle adjuster, tilt the car safety seat back by putting a rolled towel or other firm padding (such as a pool noodle) under the base near the point where the back and bottom of the vehicle seat meet. 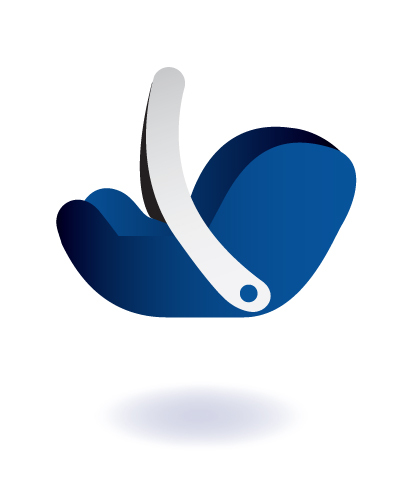 For small infants, the angle of recline should be 45 degrees. For older children, the seat can be more upright, to an angle of recline of 30 degrees. If you child slouches in the seat, you may add things around the child, not behind the child, using things such as rolled up cloth diapers or receiving blankets. Do not use any sort of car safety seat insert unless it came with the seat or was made by the manufacturer of the seat. Do not place an infant seat on the top of a shopping cart. It may seem like it clicks into place, but this is not how that locking mechanism on the seat is designed to be used. Plus, it changes the center of gravity of the shopping cart, which could make it easier to tip with just a bump. If you really want to keep the baby in the infant car seat, put the car seat in a travel system stroller and either pull a shopping cart while pushing the stroller or use the stroller basket to hold the items. Another option is to put the infant carrier in the main basket of the shopping cart and pile groceries around the carrier. Yet another option is to take your baby out of their car seat and put them in a sling or other baby carrier.